Over the years I have been on numerous cycling trips to France, and I feel comfortable about spending several hours in the saddle and riding up mountain passes. One thing I have never done is to cycle around Paris, even though I've been there so many times and I even lived there for four years at one point. So, why should I want to ? You might ask. Haphazard drivers; going on a suicide mission on those scary roundabouts at Concorde and the Arc de Triomphe; no where to park the bike - when you leave it somewhere you'd be lucky to find it still in one piece on your return - if it hasn't been stolen; and how the hell are you gonna hoist it into your flat on the 6th floor sans ascenseur ?? In those days when I lived there - 15 years ago - traffic wasn't anything as heavy as it is now, and there were some very pleasant places I could've ridden; paths along the River Seine; the wide Boulevard St Germain east towards the Latin Quarter; over the bridge into the bohemian 11th and 12th arrondissments - finally reaching the scenic green areas of the Bois de Vincennes. I was always quite sporty. I even had friends who cycled around, but it never occurred to me to take to the streets on two wheels. The good news is, cycling around Paris just got easy. 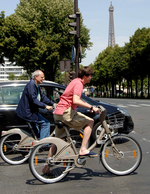 Since mid-July there's been a bike share scheme in place known as Velib. You pay a fee and a deposit to register for a day, a week or a year. You receive a card, and then you pick a bike. After your ride you pay in an automated machine. It's not very expensive. The first half hour is free, after which it can be from 1 euro to 5 euros an hour. For rentals of more than 5 hours the rate increases quite alot, as the system is devised for making short commuting trips around the city rather doing club runs ! This is not a brand new scheme. It had already been in place in other European cities, including Copenhagen, Barcelona, and even in Lyon. But it is the scale of the operation that is the talking point. Velib is the biggest community bike-share scheme in the world - almost 15,000 bikes across 1000 Velib pick-up and drop-off stations. The plan is to have 20,000 bikes by the end of the year. The principle of this "free biking" has been well received, with thousands taking to two wheels. However, there have been some drawbacks. Certain drop-off stations, notably at shopping areas and near large office blocks become overcrowded with bicycles so users are obliged to travel to find space in another drop off station. Other stations, notably the ones outside tube stops in hilly areas like Montmatre are often devoid of bicycles as users will cycle downhill. Most people are unlikely to ride uphill to drop off their bike. Also, with the sudden increase in numbers of folks cycling around the Paris streets some people get very frustrated with certain cyclists who jump red lights or mount the pavement. Needless to say 4x4's hate anything two wheeled on the road - the droves of cyclists is a nightmare for them ! These teething problems are being addressed, and luckily Paris has a scenic cycle path network using canal and river paths. 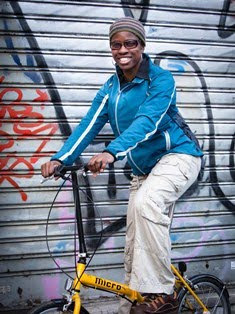 Whatever, your opinion, Velib has been real phenomenum in Paris this year, and apparently may even have assured the Mayor's re-election next year ! Sting and The Police, when they recently received an honour from the Minister for Culture, chose to travel there by Velib. 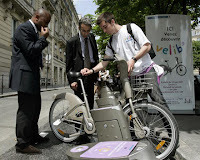 There is an official velib.fr website, and a blog to give you all the tips and advice you need. So I will certainly be getting on a bike the next time I'm in Paris - it's something I could have done years ago. Better late than never eh !